145 place aged care facility overlooking the Port Coogee Marina. De Fiddes Design provided ongoing Specialist Dementia Design consultation services including sensory design, reviewing architectural plans and landscaping design along with finishes for the Dementia Unit. Selections have been made for fitout of the whole site including product selection, tender documents and installation. This project was completed in August 2018. Significant refurbishment and redesign of 24 places for their dementia specific area. Design consultation services from concept to completion including finishes selections for build upgrade and fitout provided by de Fiddes Design. This project was completed in August 2018. A refurbishment of an existing building to service the local community. Design consultation services from concept to completion including fitout provided by de Fiddes Design. This project was completed in July 2018. 141 place aged care facility providing a holistic approach to community aged care living with a retirement village, two modern aged care homes and day therapy centre. It offers a dementia specific area, club services, Wi-Fi, Foxtel, café, day spa, cinema and hair salon. Ongoing Specialist Dementia Design consultation services including sensory design,reviewing architectural plans and landscaping design, along with finishes and fitout selections of the Dementia Unit provided by de Fiddes Design. This project was completed in July 2018. A brand new two storey clubroom to service a retirement village comprising of 76 villas. Modern, contemporary design with interiors to suit the lifestyle of all residents. Design consultation services from concept to completion including finishes and fitout provided by de Fiddes Design. This project was completed in June 2018. A 123 place aged care facility offering a dementia specific area, club services, Wi-Fi, Foxtel, café, day spa, library, cinema and hair salon. Sensory design and on going Specialist Dementia Design consultation services for the architectural design, landscaping, finishes (including additional selections) in the dementia unit provided by de Fiddes Design. Selections were made for fitout of the whole facility including product selection, tender documents and installation. This project was completed in May 2018. Significant refurbishment and redesign of 36 places for their dementia specific area. Specialist Dementia Design consultation services from concept to completion including sensory design with finishes, fitout and landscaping design provided by de Fiddes Design. This project was completed in April 2018. 178 place aged care facility located in picturesque Menora surrounded by beautifully landscaped gardens and parklands. De Fiddes Design completed a refurbishment of the second floor premium resident bedrooms and corridor areas. Design consultation services from concept to completion including finishes and fitout were also provided by de Fiddes Design. This project was completed in July 2017. 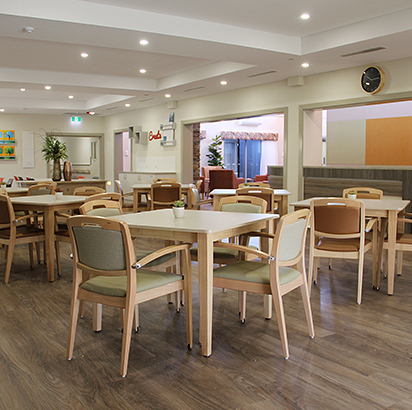 Regis, East Malvern is a new state-of-the-art Aged Care Club Services facility that comprises 149 single rooms and apartments and includes a Memory Support Unit (Secure Dementia), café, private dining room, cinema and spa therapy rooms. Specialist Dementia Design consultation services and loose furniture and accessories for fit-out including product selection, tender documents and installation provided by de Fiddes Design. This project was completed in August 2016. Regis North Fremantle is a 109 bed new residential aged care facility incorporating existing Heritage listed building. Specialist Dementia Design consultation services and selections for fitout including product selection, tender documents and installation provided by de Fiddes Design. This project was completed in June 2016. Consultation services from concept to completion, including tender management and fitout, for the Royal Australian Air Force Association’s 102 bed new residential aged care facility were provided by de Fiddes Design. This project was completed in April 2016. 81 place aged care facility redevelopment incorporating a dementia specific wing and including integrated health services - medical centre, physiotherapy centre and a wellness therapy centre, along with a pharmacy and café. Design consultation services from concept to completion including finishes selections for renovation provided by de Fiddes Design. This project was completed in May 2015.